Home > Laptops > Dell Laptop Computers > Dell Latitude E5550 15.6"
Dell Latitude E5550 Laptops delivery the best balance between cost and mobile experience for business class laptops and PCs! Made for easy portability the Dell E5550 is one of the thinnest and lightest Dell laptops of it’s generation. 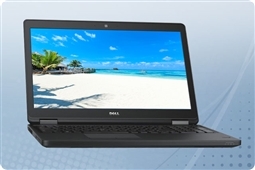 Also, with enhanced durability the Dell Latitude E5550 chassis is made to go the distance even in tough environments making it an ideal personal computer for remote employees. Plus, the Dell E5550 laptops are made to be mobile workhorses. These powerful laptops offer more ports, storage, and connectivity options than many other business laptops of the same generation. That combined with the budget friendly price makes the Dell Latitude E5550 an ideal laptop solution for small to medium size businesses (SMBs)! All Aventis Systems Dell Latitude E5550 laptops come standard with a 1 Year Essentials parts replacement warranty with upgrades available to Extended term, Express NBD parts replacement, and Secure Drive hard drive retention warranties. Need to get your Dell Latitude E5550 business laptop fast? Aventis Systems also offers Rush Build options located on the product and expedited shipping options available at checkout to ensure your laptop arrives when you need it! So check out our products below and bring the best balance between cost, power, and mobile portability to your business today with the Dell Latitude E5550 Laptops from Aventis Systems!